In a study published in the 25th of August issue of the journal, Science; researchers describe "twistron" yarns and their possible applications, such as harvesting energy from the motion of ocean waves or from temperature fluctuations. When sewn into a shirt, these yarns served as a self-powered breathing monitor. The main idea of the twistron yarns is you have a strand of conductive yarn and by stretching or twisting it will produce electricity. The yarns are produced form carbon nanotubes which is 10,000 times smaller in diameter compared to human hair. 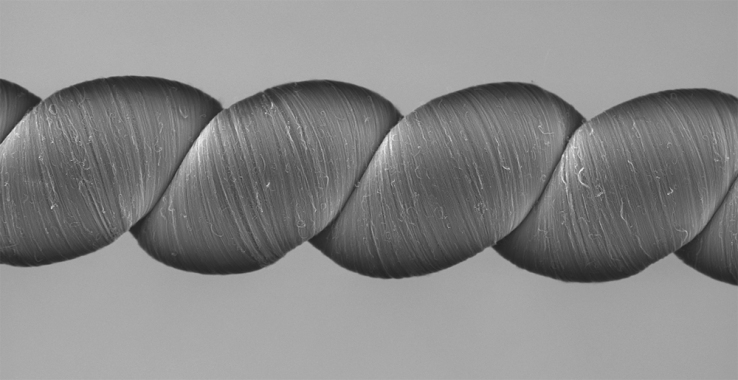 They were formed by twist-spinning the carbon nanotubes into durable, lightweight yarns to increase it's elasticity. For these yarns to produce electricity, they must be soaked in an electrolyte. An alternative way is to cover them with a conducting material. When these yarns are deformed by stretching or twisting, charges stored inside will accumulate and will cause an increase in voltage in the yarns. This explains how electricity is produced from the material. Stretching the coiled twistron yarns 30 times a second generated 250 watts per kilogram of peak electrical power when normalized to the harvester's weight, said Dr. Ray Baughman, director of the NanoTech Institute and a corresponding author of the study. In the lab, the researchers showed that a twistron yarn weighing less than a housefly could power a small LED, which lit up each time the yarn was stretched. To show that twistrons can harvest waste thermal energy from the environment, one of the researchers connected a twistron yarn to a polymer artificial muscle that contracts and expands when heated and cooled. The twistron harvester converted the mechanical energy generated by the polymer muscle to electrical energy. Want to know more about this awesome innovation? Follow this Link!